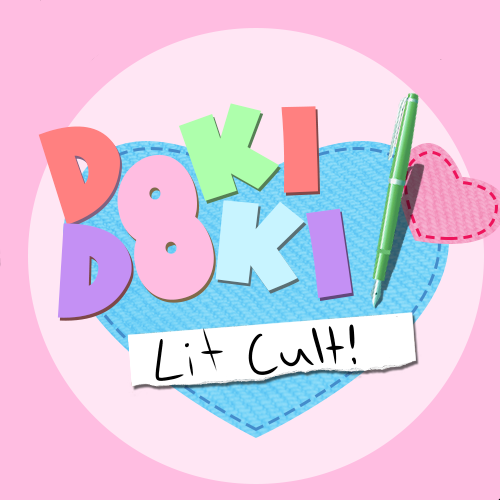 Doki Doki Lit Cult is a fandub group dedicated to ddlc memes and shitposts. Though being dedicated to memes and shitposts we're going to do a fandub of scenes the whole game or just scenes. We're also going to have monthy games and activities. There will be a chance of being kicked out if you're not doing participating in comic dubs, activities, or dubs. You'll have 2 warnings then get kicked out. 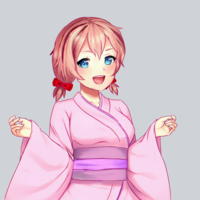 Sayori is portrayed as a talkative person, being very cheerful and kind and the archetype of a Genki Girl. She is very clumsy and notorious for finding ways to accidentally hurt herself or to drop things, as well as tricking people just to get food. She is usually the only character, other than the protagonist, capable of breaking up arguments, and she is described as being paramount to keeping a relaxing atmosphere in the Literature Club, which becomes even more apparent after her suicide. Monika notes that while she may look like a good leader, Sayori is usually better when it comes to dealing with people. Sayori tries her best to help everyone be happy and dislikes attention directed at her well-being because she feels unworthy of anything that others have to offer her. 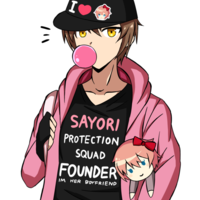 Sayori's depression makes her disorganized, and she often "cannot find a reason to get out of bed in the morning"; her room, which the protagonist often cleaned for her, is also noted to be untidy. The protagonist notes how there hasn't been much change in her, and the changes the protagonist notices in her later are due to Monika's interference, amplifying her depression and suicidal tendencies. Sayori also doesn't seem to think highly of herself. Her relationship with the protagonist and other people's happiness are her main coping mechanisms since she believes that if she makes everyone else happy, she will not have a reason whatsoever to be unhappy. Natsuki is a brash, blunt, cranky, seemingly arrogant girl with a cute, softer interior as a result of insecurity. While she is impulsive and can speak without thinking, Natsuki truly cares about her friends and, even when she has obvious anger issues, doesn't enjoy fights or arguments with people. Over the course of the game, we see that she worries about Yuri and on one occasion, gives the protagonist a note asking him to help Yuri, fearing that if she spoke out then it would cause more arguments. Natsuki has a hard time expressing how she feels and what she wants. When repeatedly challenged, she often becomes awkward and tongue-tied, then aggressive, and then simply bursts into tears. Her cute interior also involves a love of manga, particularly those in the slice-of-life genre, and baking. She has been known to store her manga collection in the Literature Club out of embarrassment, and while the rest of the club obviously knows about her interest, she is still hesitant to talk about it. Natsuki also likes cute things, like cupcakes with cat faces. She also likes poems with cuter, happier words, though her own poems are still about sad things, such as being persecuted for your hobbies. Her simplistic writing style puts her at odds with Yuri. 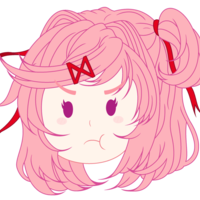 Natsuki dislikes being called "cute," even when she acts as such, or does cute things, and will deny any claims from others relating to this, nevertheless she is much more comfortable exposing her sweet side once she knows people aren't going to tease her about it. Natsuki hates it if she isn't taken seriously, whether it's her writing, her hobbies, or just her overall demeanor. It is likely Natsuki learned to be ashamed of herself and her hobbies, because her classmates judge her and her implied abusive father, making her abrasive nature a coping mechanism. This is also implied in her secret poem, "Things I Like About Papa". It is shown that she is a very lonely person who desperately craves affection. One example is during the third poetry-sharing session. If Natsuki has liked all your poems to date, she outright asks the protagonist if he thinks her poems are the best, which swiftly shifts to her begging him to say they are, even if he hates them. 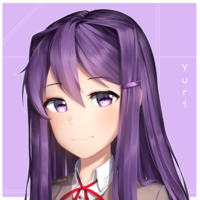 Yuri is portrayed throughout the majority of the game as being shy, generous, polite, passionate about topics she is interested in, apologetic, very intelligent, mature, and eloquent. Despite her maturity, Yuri does argue with Natsuki over their differing opinions on writing styles. While she tries to avoid the conflict at first, Yuri can be very passionate and stubborn, with her outright cursing in Act 2, though this is most likely due to Monika's tampering. Yuri can be innocently insensitive, as she sometimes comes across as condescending or pretentious without truly meaning to. Once she realizes what she said could be considered insensitive, she almost immediately apologizes, repeatedly saying she didn't mean it. As stated by the protagonist, Yuri likes to think before she says something. Yuri is the "shrinking violet" (a term to describe a character who prefers to blend in with the scenery than to attract unwanted attention) of the club members because of her constant apologetic nature and shyness to discussions beyond her category of interest, her interests being literature, horror, and general surrealism, which she examines and articulates expertly and encourages others to follow as well. Yuri's love of surrealism seems to be foreshadowing further events of the game, with Yuri's surrealistic eyes and the game's generally horrific nature after Sayori's suicide. Yuri prefers poetry that uses metaphorical symbolism and enjoys collecting unusual ornate knives which are implied she may use to cut herself for not completely specified reasons. Yuri has trouble making and keeping friends, as she tends to come on too strongly. It is said that she used to be bullied for her appearance and mannerisms, providing another possible explanation as to why she secludes herself to have an introverted lifestyle. She is, however, a generous and giving person, exemplified by her giving a copy of "Portrait of Markov" to the protagonist and for bringing tea to the Literature Club to help sooth the mind and help stay focused during reading. During Monika's Talk, Monika states that one time Yuri innocently pulled out a small bottle of wine and offered it to the club. It seems as though she was unaware of the underage drinking aspect of it, and just genuinely thought providing refreshments would be a nice thing to do. During Act 2, Monika amplifies Yuri's negative personality traits. This causes her to have sanity slippages that result in an abnormal obsession with the protagonist and her already-existing hobbies becoming more of perverted detailing and self-destruction, to the point where Monika suggests that Yuri cuts herself due to a fetish. Yuri recognizes that something is wrong with her and that her comments and behavior are inappropriate, but is ultimately unable to control her obsessive outbursts. It reaches a point where, after she confesses her love to the protagonist, Yuri stabs herself to death out of over-excitement or rejection (depending on the main character's response). Monika is noted by the other characters to be smart, beautiful, confident and athletic. She's not as talkative as the other girls, but this is implied to not be through choice. Monika had previously been a part of the Debate Club but left due to all the inner politics and drama, highlighting a desire for order, freedom of topics and friendliness. The Literature Club, which she founded after leaving the Debate Club, is very important to her. She aspires for it to be a place to showcase and grow everyone's passion for literature. 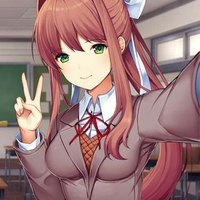 Monika openly displays care and concern for her club mates, praising each member's writing style and even comparing them to famous authors and poets. Starting from Act 2, she shows a much more manipulative personality. It is revealed that Monika was self-aware all along and resented from being made into a minor role. She becomes infatuated with the player and urges them to spend more time with her. Monika begins trying to dispose of her club mates so the player is forced to choose her, after her attempts to make the other girls unlikable fail. Her desire and ambition lead her to become obsessive in this goal, highlighted by the fact that all of her poems are about the player or her epiphany. Despite Monika's upbeat attitude in the Literature Club, it becomes increasingly obvious that she's really sad and lonely, as a result of being aware that her whole world is just a simulation; a simulation in which she can't even achieve what is considered "happiness" (i.e. having her route completed). She fixates on the player so much because they're the only "real" thing in her life. It also doesn't help that, whenever someone quits the game, Monika is trapped in a hellish void of noise, lights, colors, and screams and despite not even being able to form coherent thoughts, she remembers all of it whenever the player turns on the game again. Later in the game, the player will be able to read Monika's Talk where she talks directly to the player, instead of the protagonist.